Sometimes daydreamers like to speculate about “what if” scenarios such as what if there had been no Einstein? The answer is, astonishing and seemingly miraculous though Einstein’s breakthroughs were, someone else would have almost certainly come up with the theories of relativity and his ideas about quantum theory instead of him. It might have taken longer but in science, ideas are often nascent, as if ready for plucking – to the extent that often multiple scientists make the same discovery almost at the same time independently. With that in mind imagine what classical music would be like without Mozart, Haydn, Beethoven, and Schubert. This is actually a much, much harder thing to envisage. There’s no certainty at all that others would have stepped in to fill their place. In fact, the very opposite is true. Music, unlike science, is not there to be discovered pre-existing in some Platonic realm: each of these composers made unique contributions to the musical world that would never have been created without them, so much so that their absence would leave a gaping hole in the repertoire and in our hearts. So try putting yourself in the mind of people who rarely or never listen to classical music. They are effectively in the same place as the culturally impoverished people in our fictitious “what if” scenario and yet they need not be there at all! Given this, what better way to revel in our good fortune that we have the fruits of these composers’ immense labors bestowed upon us than listen to these concerts? Our music series “Viennese Legacy”, which will span a two-year period, will celebrate the contributions of these illustrious composers to the world of chamber music where they made some of the greatest contributions of all time. It is not only a chance for some of us to refresh our memories about some of the marvelous works they wrote but also an opportunity for people not so familiar with the repertoire to become acquainted. The series opens with two violin sonatas, one each by Mozart and Beethoven, and the Piano Trio in B flat by Schubert. Mozart wrote some 16 violin sonatas in his childhood years and another 20 as an adult. The earlier sonatas are rarely performed these days because they are basically piano sonatas with violin accompaniment as are many of Haydn’s works for violin and piano duo. Meanwhile, given Haydn’s importance to the advancement of chamber music it would have been amiss to neglect him entirely so we will also feature two of his most famous works in this genre. The Mozart Sonata in C major K. 296, with which our series begins, is the first of the composer’s mature works for the duo. It belongs to what is known as the composer’s “Mannheim period”, written while he was visiting the city after leaving his home town of Salzburg in search of new employment and better prospects. The mature sonatas can be divided into three main periods, the Mannheim and then two phases while the composer was living in Vienna. Key works will be featured from all three periods. these sonatas are often performed today with the violinist getting headline billing even though the pianist’s role is often more taxing and virtuosic. The trend to equality is particularly evident in the set of ten violin sonatas by Beethoven which will be presented in their entirety over the run of our series. The early group of three Op. 12 Sonatas reflect the composer’s initial approach where he picked up from Mozart and Haydn. But as he evolved, his approach became more sophisticated and innovative. While the Sonata Op. 24 in F “Spring” remains one of the most popular in the set given its abundance of sunny melodies and uplifting spirit, the contrasting Sonata Op. 30 No. 2 in C minor represents Beethoven at his stormiest, writing in the same key as his Fifth Symphony and the Pathétique Piano Sonata. The famous “Kreutzer” Sonata Op. 47 represents a new level of virtuosity for the violinist which by now has fully caught up with demands made on the pianist. The last Sonata in G major Op. 96 borders on Beethoven’s late period style, where the composer’s textures reached their most complex, integrated and condensed form yet. Interestingly, Beethoven’s cello sonatas, although he wrote only five, span a wider period of time than the violin sonatas with the first two Op. 5 Cello Sonatas coming earlier than the Op. 12 Violin Sonatas and the two Op. 102 Cello Sonatas marking for many scholars the true beginning of his revolutionary late period. The series will give audiences a chance to hear all of these remarkable works in their chronological order and thus an opportunity to hear how Beethoven’s style evolved within the compressed time frame of our series. The series opener also features one of Schubert’s two masterpieces for piano trio, a chamber ensemble form which includes both violin and cello. The Piano Trio in B flat is the lighter of the two and although written at about the same time as the second, the latter is a much darker work as if pre-shadowing his untimely death at the age 31 that was less than a year away. This second work, the Piano Trio in E flat, which features a hauntingly sad cello solo in the slow movement and a finale conclusion that reiterates the same theme but in a brilliantly transfigured form, will make for a powerful close to the series. In contrast, Schubert’s violin sonatas, although written after Beethoven’s, represent a curious throwback to Mozart’s works in that they are on a more modest scale than Beethoven’s violin sonatas, and are almost a little naive in their style. The composer, of course, wrote them in his youth and one wonders how much he knew about Beethoven’s titanic achievements in the same form yet they still possess a fundamentally Schubertian charm. However, in the penultimate concert we will have a chance to hear Schubert pulling out all of the stops with his Fantasy for Violin and Piano, a much more virtuosic work that makes the steepest technical demands on both instrumentalists. In totality, the series will give audiences the opportunity to perceive something of the immense and beautiful soundscapes opened up by these Viennese composers and to appreciate how far reaching their legacy truly was. 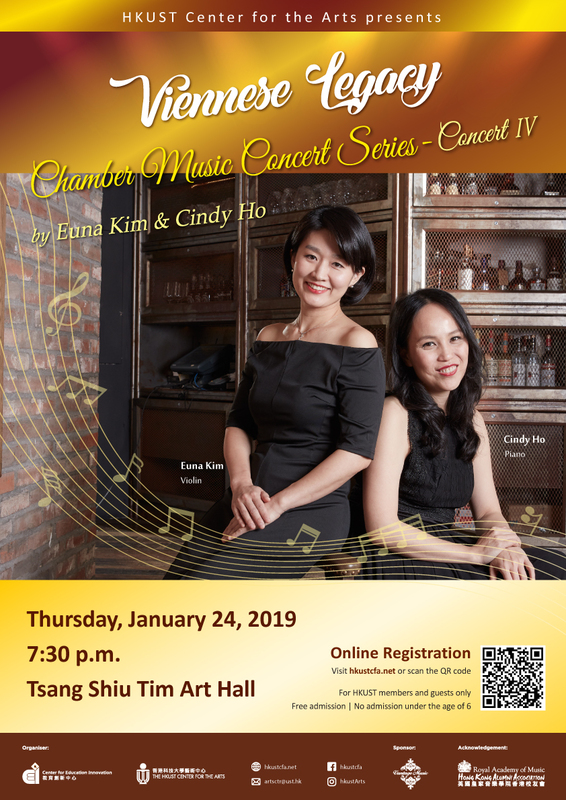 Born in Seoul, Korea, Euna Kim has performed solo and chamber music recitals in cities in Germany including the Konzerthaus in Berlin and Schloss Albrechtsberg in Dresden, Cologne, Essen, Detmold, Ratingen, and Duesseldorf. She was also invited to the Suzett Summer Music Festival in France, Verbier Music Festival in Switzerland, Gaida Contemporary Music Festival in Lithuania, the Crescendo Music Festival in Berlin, the Niedersachsen International Chamber Music Festival in Germany and several other major occasions in Europe including Austria, Italy, Lichtenstein and Sweden. She also performed at the Bowdoin Music Festival in the USA, Japan and China. Between 2009 and 2010, she successfully completed performing the concert series Complete Beethoven Sonatas for Piano and Violin in Seoul, Korea. Also, since 2016 she has been performing all sonatas of Brahms and other works which had influenced him under the title Brahms and his friends. As a soloist, she has performed with Seoul Chamber Orchestra, Seoul Academy Symphony Orchestra, KBS Symphony Orchestra, and Suwon Philharmonic Orchestra. Euna is also actively playing contemporary music and has been participating in numerous chamber music performances in Iceland, Czech Republic, Korea, Hong Kong and Macau including the Hong Kong Arts Festival, Le French May, New Vision Arts Festival and Macau International Music Festival. She released CDs by Arts Council Korea as a member of Contemporary Music Ensemble Eclat in Korea and is currently playing for the Hong Kong New Music Ensemble. Euna has won first prizes at numerous competitions in Korea and was a winner of the Felix Mendelssohn-Bartholdy Competition in Germany. In addition to actively performing, she taught at the Korean National University of Arts including at its Pre-school teaching young talents. She holds a Bachelor of Music Degree from the School of Music at the Korean National University of Arts, a Diploma in Violin Performance and Chamber Music from the Kölner Musikhochschule in Germany, and a Konzertexamen from the Staatliche Hochschule für Musik und Darstellende Kunst in Mannheim. She studied under world renowned violinists Nam-Yun Kim and Zahkar Bron. Kitty Cheung is a member of Contrast Trio, first violinist of Romer String Quartet, and violin faculty at the Hong Kong Baptist University. She served as the Associate Concertmaster of the Hong Kong Sinfonietta from 2011 to 2017. In the past she performed in London Symphony Orchestra and Rochester Philharmonic Orchestra, and led ensembles which had made recordings for Loft Records, New World Records and Bridge Records. In 2017 she was invited as guest concertmaster at the Hong Kong - Vienna Music Festival. She has given solo recitals in Germany, Vienna, UK, USA, Thailand, Hong Kong and Shanghai, and made solo appearances with orchestras including the Hong Kong Sinfonietta and Hong Kong City Chamber Orchestra. She recorded broadcast performances for BBC Radio 3 and Radio Television Hong Kong. An active chamber musician she performed at Carnegie Hall, Wigmore Hall, Shanghai Concert Hall, Toppan Hall in Japan, Sabah Art Gallery in Malaysia, Eastman School of Music in USA, Central Conservatory of Music in Beijing, The University of Macau, Hong Kong Arts Festival, Hong Kong International Chamber Music Festival, Marvao International Music Festival in Portugal, “Lakes Area Music Festival” in USA, and “Hong Kong Week” in Taiwan. She gave masterclasses in various festivals and universities in USA, Thailand, Hong Kong and Malaysia. Romer String Quartet and Contrast Trio were invited as Ensemble-in-Residence of The Chinese University of Hong Kong in 2014-15 and 2017-18 respectively. Romer String Quartet was also the Associate Quartet-in-Residence at the Hong Kong New Music Ensemble’s The Modern Academy. Kitty holds a Doctor of Musical Arts degree and the Performer’s Certificate from the Eastman School of Music, where she was appointed the Teaching Assistant of Professor Charles Castleman, and won prizes in excellence in teaching, excellence in chamber music and the Lecture Recital Prize. Prior to that, she received Master of Music and Master in Music Performance (Guildhall Artist) degrees, both with distinction from the Guildhall School of Music and Drama. Her teachers included Lin Yao-Ji, Ho Hong-Ying, Charles Castleman, David Takeno and Zvi Zeitlin. Joanne kim is active cello solist. She performs chamber music every year as a member of Vantage Trio and gave solo recitals in 2016 and 2017 in Hong Kong. She served as the principal cellist at the Seoul Symphony Orchestra and also performed with the Black Sea City Orchestra at the Black Sea Festival in Romania. Joanne has given solo and chamber recitals at the Seoul Art Performing Center in Korea and at the Iserlohn kirche in Dortmund in Germany. She was awarded the Best Musician of the year at the Black Sea Festival and came second as part of a string quartet in the young artist competition in Westfalen, Germany. Joanne graduated from the Seoul Art High School in Korea and studied cello under Professor Kim Bong, who was known as an innovator of André Navarra within Korea at the time. She then furthered her studies in Germany with Maria Kliegel at the Musikhochschule Köln and Hannover Musikhochschule with Heintz Klaus. She graduated from Künstlerische Grundlagen and Künstlerische Ausbildung at Hochschule für Musik Detmold under Professor Gotthard Popp in Germany. Musicians she has worked with, and whom she has been inspired by include Arto Noras and Jens Peter Maintz in Vienna and Prague. As an educator, she was a lecturer of string-chamber music and professional performance program in several art high schools and universities in South Korea. She continues to teach and coach chamber music privately in Hong Kong. An active soloist and chamber musician, Hong Kong born Steinway Artist Cindy Ho performs internationally. Recent highlights include concerts at Carnegie Hall as part of the 20th Anniversary of the establishment of Hong Kong Special Administrative Region, collaboration with Thymos Quartet for Le French May, International Macau Music Festival, Shanghai Concert Hall and Kilbourn Hall of Eastman School of Music. All concerts are free and open to all. Children under the age of 6 will not be admitted to concerts. We regret that this event has been POSTPONED due to personal issue of the artist. New date will be announced later.